Locate, close with, and destroy the enemy through fire and maneuver, and repel enemy assault through fire and close combat. 3rd Battalion 1st Marines (3/1) is an infantry battalion in the United States Marine Corps based out of Camp Horno on Marine Corps Base Camp Pendleton, California. Nicknamed the "Thundering Third", the battalion consists of approximately 1220 Marines and Sailors and falls under the command of the 1st Marine Regiment and the 1st Marine Division. 3rd Battalion, 1st Marines was activated on 1 March 1941 at Guantanamo Bay, Cuba and assigned to the 1st Marine Division. In April of that year, they were relocated to Marine Corps Recruit Depot Parris Island, South Carolina; the unit was subsequently deactivated in October of that year. 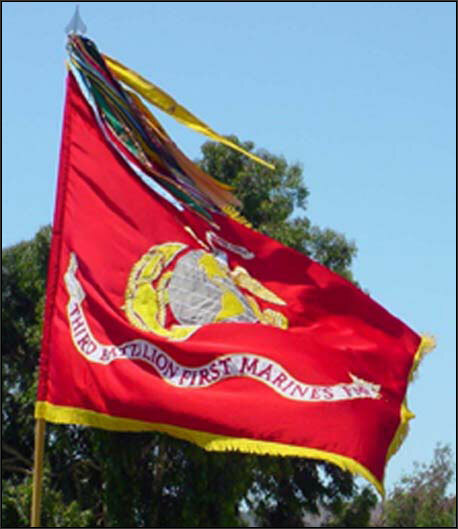 3rd Battalion 1st Marines' standard. On 16 February 1942, 3/1 was re-activated at New River, North Carolina. In July 1942, they deployed to Wellington, New Zealand and participated in the following World War II campaigns: Guadalcanal, Eastern New Guinea, New Britain, Peleliu and Okinawa. Beginning in April 1946, they participated in the occupation of North China. The battalion was again deactivated on 20 March 1947 as part of the post-war drawdown of forces. The start of the Korean War saw the reactivation of 3/1 on 4 August 1950 at Marine Corps Base Camp Pendleton, California and their quick deployment to Korea in September. The battalion's first action was at the Battle of Inchon in September 1950. Following the recapture of Seoul, 3/1, along with the rest of the 1st Marine Division, was put back on ship and sailed around to the east coast of Korea. They eventually landed at Wonsan ino late October and from there participated in the Battle of Chosin Reservoir. During the battle they were the only battalion from the Chesty Puller's 1st Marine Regiment to make it as far north as Hagaru-ri. After the withdrawal from Chosin, the battalion took part in fighting on the East Central Front and Western Front for the remainder of the war. After the Korean Armistice Agreement was signed, they participated in the defense of the Korean Demilitarized Zone from July 1953 to April 1955. In April 1955, the battalion re-located to MCB Camp Pendleton, California. From October to December 1962, 3/1 was part of the amphibious task force sent to the Caribbean in response to the Cuban Missile Crisis. From January 1966 to May 1971, the battalion fought in the Vietnam War, operating from Chu Lai, Da Nang, Thang Binh, Thanh Thuy, Cua Viet, Ca Lu Combat Base, LZ Stud(Vandergrift), Route 9, An Hoa, and Hoa Vang. In May 1971, they re-located to MCB Camp Pendleton, California. February and March 1995 saw a deployment to Somalia to support Operation United Shield, helping the remaining UN troops evacuate. The next major deployment was in October 2000 to support Operation Determined Response. 3rd Battalion, 1st Marines deployed to Kuwait in January 2003 and in March of the year took part in the 2003 invasion of Iraq, including the Battle of Nasiriyah. The battalion re-deployed to Camp Pendleton in the summer of 2003. The unit then re-deployed to Iraq in mid-2004 and was based near Fallujah. They were the main effort in November 2004 during in Operation Al Fajr (pronounced Al Fad-jer), the retaking of the city of Fallujah. Before the assault commenced, the operation was known as Operation Phantom Fury. 3rd Battalion, 1st Marines was part of the composition of RCT 1. RCT 1 was partly responsible for clearing the infamous Jolan District among others. Alongside RCT 7, four Marine battalions (including 1/3, 1/8, and 3/5) and various US Army units reclaimed the city of Fallujah from unrest. The battalion re-deployed back to Iraq in September 2005 and were attached to 2nd Marine Regiment (known as Regimental Combat Team 2), and on 20 February 2006 were attached to the 7th Marine Regiment (known as Regimental Combat Team 7) in western Iraq, carrying out security and stabilization operations. The Battalion returned to Camp Pendleton at the end of March. On 10 April 2007, 3/1 deployed as the ground combat element of the 13th Marine Expeditionary Unit. They were ordered into Iraq as part of Operation Phantom Thunder. Operating north of Fallujah and Karmah in the Thar Thar region in AO Anaheim, MARSOB units attached to the MEU were operating for several days before the ground combat element began operating on 15 June 2007. They were to establish a coalition presence in an area that had only had 14 days of coalition presence since the invasion in March 2003. 3/1 finished operations in Iraq after 90 days of operating on 20 September 2007 and soon after re-embarked on the naval strike group and set sail for the United States and returned to Camp Pendleton on 17 November 2007. 3/1 deployed to Okinawa in July 2008 as part of the ground combat element of the 31st Marine Expeditionary Unit. As of December 2006, Marines from Kilo Company (K/3/1) were under investigation for their actions on 19 November 2005 after Time magazine published an article accusing them of killing 24 unarmed Iraqi civilians, including 11 women and children. Residents of Haditha in western Iraq claim that the Marines killed 15 civilians in response to the death of Lance Cpl. Terrazas by an improvised explosive device. The incident is currently under investigation. According to a 29 May 2006 report by The Times, Lieutenant Colonel Jeffrey R. Chessani was the commanding officer and was removed along with Captain Luke McConnell. Due to lack of evidence, the case against LtCol Chessani was dismissed "without prejudice," on 17 June 2008. An appeal was filed 19 June 2008 by the assigned prosecutors in the case. In April 2010, 3/1 deployed to Helmand Province, Afghanistan in support of Operation Enduring Freedom. The battalion conducted combat operations in the area, including activity in Koshtay and Safar in Garmsir District, and returned to Camp Pendleton in November 2010. Marines from the 3/1 have been awarded the Medal of Honor for actions during World War II and the Korean War. ↑ Rottman U.S. Marine Corps WWII Order of Battle, p.166. ↑ "Operation Determined Response". GlobalSecurity.org. http://www.globalsecurity.org/military/ops/determined_response.htm. ↑ Schnell, Cpl. Adam C. "Camp Pendleton-based Marines leave no place for insurgents to hide in western Al Anbar", MarineLink, 6 March 2006. ↑ "US Marines massacred 15 Iraqi civilians: report", The Hindu, 20 March 2006. ↑ Reuters, 21 March 2006. ↑ Kovach, Gretel C., "Marines expand their influence in southern Afghanistan", Sign on San Diego, 28 August 2010. ↑ Kovach, Gretel C., "Camp Pendleton's Thundering Third Returns", Sign on San Diego, 16 November 2010. Russ, Martin (1999). Breakout" – The Chosin Reservoir Campaign, Korea, 1950.. Penguin Books. ISBN 0-14-029259-4. O'Donnell, Patrick (2007). We Were One: Shoulder to Shoulder with the Marines Who Took Fallujah. Da Capo Press. ISBN 0-306-81573-7. Rottman, Gordon (2002). U.S. Marine Corps World War II Order of Battle - Ground and Air Units in the Pacific War, 1939 - 1945. Greenwood Publishing Company. ISBN 0-313-31906-5.